What is this wrap? Well… it’s a little like the Yael, and a little like the Regal Wrap, and a little like the perfect turban… but it’s not any of those! It’s a gorgeous, elegant, and very simple wrap for any pashmina – and just in time for the change in the weather! It’s possible to wrap it completely knot-free, it works with even the thickest pashminas, and it takes just a few minutes. Introducing Rachel’s latest! ← Cozy (and chic) Pashmina Turban with Rachel! I am excited by this Rachel. It looks super easy, without as many of the annoying wee bulges & puffs that I have to “settle” in my normal turbans. I am off to try it now!!! It definitely has a sleek profile. Hope you like it, Selina-Jane! Rachel this turban looks terrific with so many different tichels. I loved wearing it tonight with my shine on! Thank you so much for you tips. Ithe is a quick wrap that looks clean, elegant and so streamlined. I know I will be using it a lot! I used this wrap first thing this morning when I had to take our dog out. It was awesome! So fast but so chic. It’s going to be a favourite of mine for sure. So glad that you enjoyed it and are finding it useful, Adrienne! 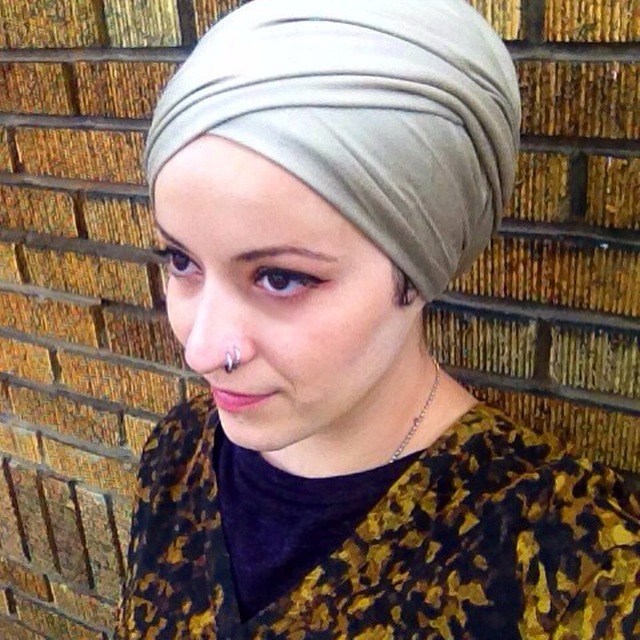 Hi Rachel, I like this tutorial and yes – you are very clear and understandable 🙂 I love the photo with the shirt and turban matching completely. How did you do that? Have you made the shirt yourself? Hi, Hassiba. So glad that you enjoyed the tutorial! That scarf and dress were actually purchased separately from the same retailer, but I decided to wear them together.